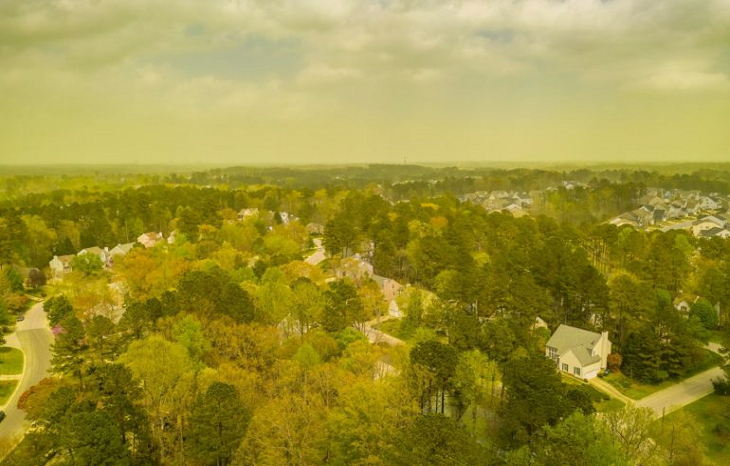 Residents of Durham, North Carolina encountered what some are calling “pollmageddon,” during which an onslaught of greenish-yellow pollen blanketed the area. It covered cars and patios, and even visibly floated through the air. Photographer Jeremy Gilchrist saw the allergy apocalypse from his car and sent up his drone to document it. The region’s trees have begun mating in the warmer weather, and that means high pollen counts. The Raleigh-Durham area experienced the fifth highest pollen count in the U.S. on Wednesday, according to Weather.com. From 10 a.m. Monday to 10 a.m. Tuesday, the North Carolina Department of Environmental Quality reported that the count was over 2,500 pollen grains per cubic meter. Historically, North Carolina’s pollen levels have stayed between 1,000 and 1,500 grains per cubic meter during peak season. The highest pollen count ever recorded in the Raleigh-Durham area was 3,524 grains per cubic meter—Thursday’s count is expected to come in a close second. 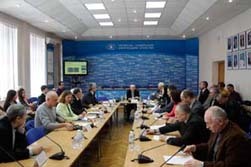 Research suggests climate change could be to blame. It heightens temperatures and makes warmer weather last longer, giving plants more time to release pollen. This makes allergy seasons longer and more intense. What’s more, a 2010 study conducted by the Asthma and Allergy Foundation of America found that ragweed (another source of pollen) releases more pollen at higher carbon dioxide concentrations. Several hours after Gilchrist took the photos, residents got a much-needed break from the particles after thunderstorms rolled through the area and washed most of them out of the sky. Gilchrist captured that, too. But North Carolinians aren’t out of the allergy-infested woods yet. Pollen counts through the end of this week are expected to remain very high as the trees continue their airborne courtship. Hunker down—it’s going to be a sneezy, yellow spring.